After abandoning the April release date originally announced, Epic Games has chosen a date that falls conspicuously before the 2011 Holiday season. A long time ago, in a galaxy very close to us, Epic Games announced that the next installment of its vaunted shooter franchise would come out in April 2011. Many of you might remember that the venerable Clifford Bleszinski appeared on mainstream Late Night with Jimmy Fallon to tout Gears of War 3 with great fanfare. Then last October, news came from on high at Epic that the April release date had slipped to Fall 2011, not because the game sucked or needed more development time but because Microsoft and Epic wanted the game to be its "marquee title" of the Holiday 2011 season. It appears that motivation still holds true and you can now set your calendars: Gears of War 3 is coming out on September 20th, 2011 on Xbox 360. Despite all of the attention that Bulletstorm is getting them nowadays, Gears of War has been pretty good to Epic. The first game was a surprise hit back in 2006, and the sequel sold 2 million copies in its first week. Overall, the whole series has moved more than 11 million copies worldwide. I'm sure that Microsoft and Epic Games hope 3 times the charm and that Gears of War 3 will be the breakout shooter to outdo the likes of the Modern Warfare and Battlefield franchises. It's pretty much guaranteed that it will sell more copies than Medal of Honor at the very least. You'd think that all of the extra time would allow Epic to work on a PC version for a concurrent release, but there's been no word if the team is even working on porting it to the mouse and keyboard. Come on now, Epic. Don't abandon your PC fans. 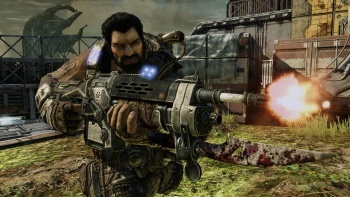 Oh, and if you're interested in Gears, you might want to pick up the "Epic Edition" of Bulletstorm to guarantee your spot in the Gears of War 3 beta when it becomes available. That is, if you can still find an Epic Edition in stores.